Recent news reports of unsafe drinking water in the Great Lakes area has drawn national attention to toxic algal blooms. In Kentucky, cyanobacteria, also known as blue-green algae, recently were found in Green River Lake, Taylorsville Lake, Barren River Lake, Nolin Reservoir and Rough River Lake at levels that prompted a recreational advisory. Algal blooms are accumulated populations of algae in freshwater and marine water environments. They can reduce water quality, so animals might not drink as much as they need to get them through the hot, dry summer. Of the more than 2,000 species of blue-green algae identified, at least 80 are known to produce cyanotoxins (poisons) that can seriously affect animal and human health. Blue-green algae naturally exist in wet places. They thrive in warm, stagnant, nutrient rich water and are found often in ponds, lakes and slow moving rivers. 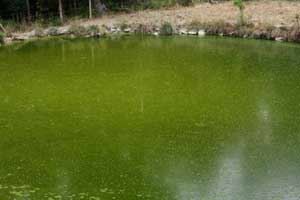 While not all algae are harmful, farm ponds contaminated with fertilizer runoff or direct manure and urine are the perfect environment for harmful blue-green algae. When the weather is hot and dry, rapid growth of the algae can result in a “bloom,” or a build-up of algae that creates a green, blue-green, white or brown coloring on the surface of the water. It may look like a floating layer of paint. If it’s windy, the algal blooms may concentrate along the water’s edge, which increases the risk for livestock to ingest the algae when they come down to the pond for a drink. Animals that consume affected water may die suddenly or suffer from weakness, staggering or photosensitization depending on the toxin and how much they ingested. A few simple steps can keep livestock, pets and humans safe from algae poisoning. Always assume that a blue-green algal bloom is toxic. Provide clean, fresh water to animals and fence off their access to stagnant, scum-covered ponds. If the water source is treated with an algaecide such as copper sulfate, prevent animal access for at least a week to allow degradation of any released toxins in the water. It is best to wait until ponds are no longer stagnant before allowing animals to drink from it. “Creating and maintaining natural buffers, such as trees and shrubs between farmland, housing developments and waterways can help filter out excess nitrogen and phosphorous before they reach the water,” said Steve Higgins, director of environmental compliance for the UK Agricultural Experiment Station. To protect humans, don’t swim in water with scum layers or blooms and avoid jet skiing, windsurfing, tubing or water skiing over scum or blooms. Don’t use untreated water for drinking, cleaning food or washing camping gear. Boiling water will not remove algal toxins. Thoroughly wash any skin that comes into contact with a bloom. Don’t eat shellfish caught or harvested from a bloom area. Farmers who notice algal blooms in ponds intended for livestock use should get the water tested. Not all algal blooms produce toxins. The UK Veterinary Diagnostic Lab can accept water samples and forward them to referral labs to identify blue-green algae and test for toxins. Visit http://vdl.uky.edu/TestInformation.aspx and search under “Toxicology” for further information regarding sampling and pricing.